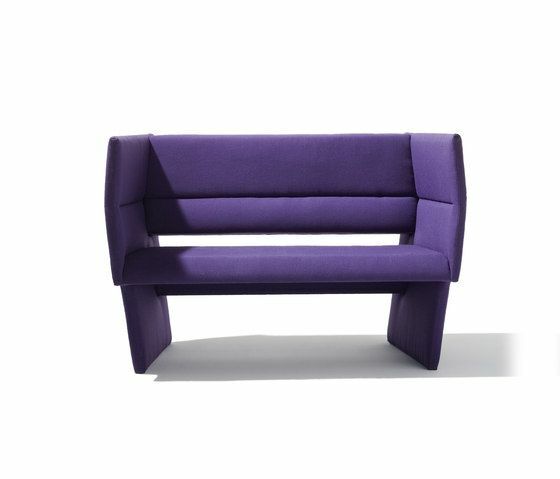 A piece of seating furniture combining avant-garde design with traditional high-end upholstery and boasting a solid wood frame, webbing and multi-layer foam padding. Architect and designer Eric Degenhardt approached the design from an architectural perspective, breaking up the shape into individual surfaces. This has resulted in a compact yet lightweight look. The design’s most striking feature are its clear slender lines that also define the sofa’s back and make it beautiful to look at from all angles. You can also choose different covers for Cup’s interior and exterior surfaces. With additional cushions, you can create colourful accents. Thus architects and interior designers can put together customised designs for sofas used in hotel lounges or in the waiting areas of offices. Cup is also perfect for the home: for those who prefer to read or watch television in a focused and upright posture. The seat height is similar to that of a chair, but while offering much more comfort than a chair, this sofa will not put you to sleep. It’s the perfect complement to lower sofas, which support lying rather than sitting. For those moments when you want to be comfortable without falling asleep.